Additionally, we guide owners through the sale or dissolution of a company. We have more than 30 years of experience practicing law. The team at our law firm is always apprised of changes in the ever-evolving business world, whether that applies to new legislation or emerging technology. Our memberships with organizations, such as the Mobile Bar Association, the American Bar Association and the Alabama State Bar Association, are an integral part of our representation, as they connect us with invaluable resources and personnel. Our founder, Richard Corrigan, is held in high esteem among clients and peers. He has an Avvo "Superb" rating and has also earned a BV rating from Martindale-Hubbell*. This is due not only to the exceptional results we obtain, but also the way we get there. Our staff is committed to communicating effectively with clients and responding to their concerns promptly and honestly. 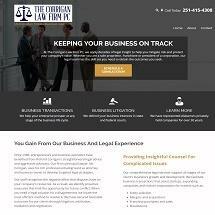 The Corrigan Law Firm accepts credit cards.